Valerie at Home: Roses. Beautiful, beautiful roses. A week or so ago, I got tired of waiting for the HOA to replace the dead bushes in our landscaping. We live in a townhome, so the HOA takes care of everything outside the house. I've asked, reminded, and finally joked to the sales office that I was going to simply plant rose bushes instead. 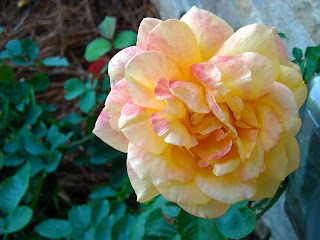 A few days later I got an email giving me the go-ahead for the rose bushes. So I went to the garden center, found the roses, and wavered back and forth between two different varieties. I bought one bush of sunshiny orange roses and planted it next to our door. There are two blooms on it at the moment and they are gorgeous. So amazingly gorgeous that I had to post pictures. I love the bright orange color of this one. It's a beautiful, perfect rose shape. This one is my favorite. It's large and a little fluffier. The pink edges just make me giddy. It's an incredible thing to me that one bush can produce two such different blooms. I edited the post to add the Tuesdays Unwrapped button from my friend Emily's blog, Chatting at the Sky. What? You don't think I know Emily? I do! I helped her order bloggy business cards at She Speaks last year. She's a lovely person and has a fabulous blog and you need to go check her out! Hi Valerie!!! So glad you linked up. You're right, this post is perfect. And can I just tell you that top orange one? That is my favorite color rose. So glad you photographed it! That is soooo pretty! The roses we bought last year have red blooms and white blooms on the same bush! They are cross bred I think. 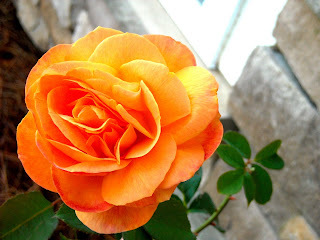 I love, love, love the orange rose!! So beautiful. Thanks for sharing. I'll have to check out Emily's blog too.